The conversation between Salman Rushdie and John Freeman, former editor of Granta, at the Edinburgh International Book Festival took place in front of a packed-out audience eager to hear from the author whose life and work reflects on the massive culture clashes in our world, and who has become intimately involved in the principle of free speech. The talk ranged over a multitude of incidents, anecdotes and reflections on the literary career and life of this British Indian novelist and there was a warmth about Rushdie at odds with the persona built up by the press. 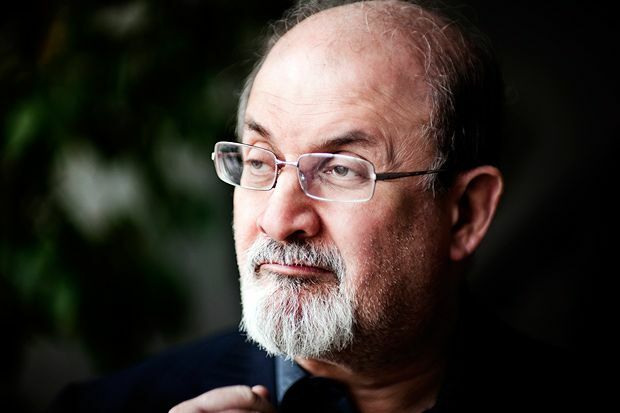 He is a good raconteur and extracted humour from his career including the difficult years living under the Fatwa issued by the dying Supreme leader of Iran after the publication of his novel The Satanic Verses in 1989. His tale of the unwillingness of London based Special Branch protection officers to release their charge to the Scottish officers allocated to look after him when he came to Ayrshire for a week end caused considerable mirth. Rushdie gained a large following as a writer and won the Booker prize in 1981 for Midnight’s Children, a story of the birth of India and Pakistan. But the notoriety forced on him by the Fatwa was unwelcome and destructive. He explained that although he realised his work was disliked by conservative Muslims, he had never anticipated such a reaction to his book, and he was sorry for the terrorism it had caused. So, we have a case of misjudgement, but also where the aftermath has forced the liberal world to stand up for free speech; something we should all be glad of. Rushdie reminded us that this clash between East and West did not start in our lifetimes and certainly not with Satanic Verses - it has been going on for centuries. He then linked to a new characteristic of our age: the culture of offendedness. "I do think one of the characteristics of our age is the growth of this culture of offendedness. It's got something to do with the rise of identity politics, where you are invited to define your identity quite narrowly - what's happened in this age is we are asked to define ourselves by hate." He was rather more elusive in reply to a question on why he had moved to New York – indicating succinctly ‘What’s not to like?’. Rushdie mused on how the novel looks into life, on how he changes his style in order to discover and reveal how people live and on how he enjoys the malleability of the English language and its variation. His memoir, Joseph Anton, is named after the pseudonym he used during the Fatwa period and created from the first names of Conrad and Chekov, it focuses on the nine years living under the death threat. He spoke of the loyalty of friends during this time and the discussion moved on to the nature of friendship and ideas. He outlined his experience of succeeding in having savage disagreements with people at the level of ideas, yet remaining great friends, citing Christopher Hitchens as an example. Perhaps this gives us a clue as to why he wrote Satanic Verses, and did not factor in correctly the offence likely to be caused and its consequences.